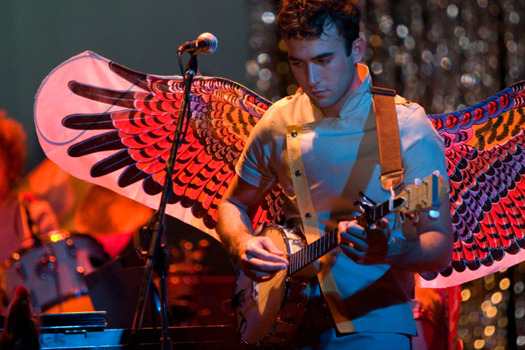 I’m happy to have had a small part in bringing Sufjan Stevens back into the public eye. Last Thursday, my friends at his record label, Asthmatic Kitty, finally ran with this brief scrivening we worked up about his new instrumental record Run Rabbit Run. Roughly speaking it is a string quartet transcription of his early instrumental experiment Enjoy Your Rabbit. Brassland is well represented on the album, with inspiration for the transcription project coming from my label partner, Bryce Dessner, illustrations from Bryce’s sister Jessica, and an orchestration by Nico Muhly. In even better news, on Friday, the world-renown festival promoter whom I represent in America, All Tomorrow’s Parties, announced Sufjan’s first US show in more than two years. He’ll be playing the festival we’re throwing upstate at Kutsher’s Country Resort in Monticello, NY from Sept 11-13. A line-up which was previously blowing my mind has now exploded it. The weekend now includes, among many others, The Feelies, Boredoms, David Cross, Grouper, Iron & Wine, Animal Collective, and Caribou who, for this appearance, will include special guest Marshall Allen (?!? ), leader of the Sun Ra Arkestra. A constant news feed on the event can be accessed on this internet webpage. I’ll leave you with this video of Sun Ra’s group at the height of their powers which, following my recent vid posts of Jason Faulkner and Ornette Coleman, might lead you to believe that I’ve discovered a newfound and inexplicable fascination with jazz. (I will deny this fervently.) Marshall Allen gets his starmaking cameo at the 30 second mark.